Myles Geary steps down from Lady Kats soccer program after record 183 wins and eight sectional titles. KOKOMO, Ind. – It is rare when coaches go out on top of their game. 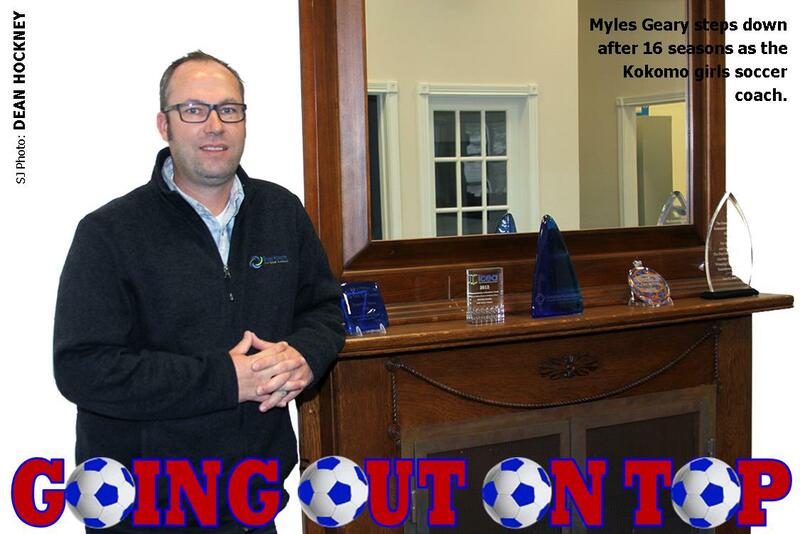 But Kokomo High School girls soccer coach Myles Geary has 15 consecutive non-losing seasons; so, he had no choice but to go out on top once he made one of the toughest decisions of his life – leaving the program that he took from infancy to an NCC respected power. With a record of 183-103-6 (.627 winning percentage), Geary leaves the Lady Wildkats as the most successful coach in the program’s history. But in 1996, the program was young, unsuccessful and Geary was completing his third season at Western high school as an assistant boys soccer coach. But then KHS Athletic Director Jim Callane decided to take a chance on the 1989 Kokomo graduate. And what a choice that turned out to be. After a 5-11-2 record in his inaugural campaign of 1997, the program never again dipped below .500 under his watch. By his third season, Geary had the Lady Kats hoisting an IHSAA sectional championship trophy as the team tallied a 15-4 record. According to Callane, the Wildkats started a soccer program in the late 1980’s as a recreational co-ed club sport. The IHSAA did not sanction soccer until 1994 and the North Central Conference followed suit in 1998. Geary took over a girls team that finished 1-15 and was outscored 120-11. During Geary’s 16 seasons of patrolling the Red and Blue sideline, the Lady Kats won eight sectional championships and one regional title in 2002. They also won five North Central Conference crowns and a prestigious Hoosier Cup division championship last season. The eight sectional and five NCC championships are both conference records. His eight sectional trophies account for nearly 12-percent of all Wildkat girls sectional championships in all sports. In addition, Geary has coached an Indiana All-State First Team performer (Hillary Beck) and three All-State Second Team players (Whitney Beck, Samantha Bledsoe and Betsy Bixler). In addition, Sarah Schwartz, Jessica Carney, Casey Connor, Anne Thatcher, Whitney Farris, Becca Wade, Bre Kinder, Kristen Clason and Mary Lang were All-State Honorable Mention performers and more than 50 student-athletes were named to the all-North Central Conference teams. Geary said he thanks the Kokomo administration – from Callane to Mike Wade to current Athletic Director Jason Snyder – for the support and what they have done for the Lady Kat soccer program. He said there are not many high schools that have tournament ready facilities like Kokomo’s two lighted playing fields and two practice fields. He said the Wildkat soccer complex is an envy of the Hoosier state. The soccer buff said he enjoyed his 16 years of coaching the Lady Kats, and was thrilled to be on the early side of the program’s growth into a perennial conference and sectional contender. Snyder said replacing Geary will be difficult, not only because of his longevity in the program, but his knowledge of the game itself. To say Geary will be missed at Kokomo High School is a vast understatement. Sure, he can be replaced, but losing a coach with his winning credentials will be hard shoes to fill. Myles Geary may have arrived as an unheralded coach, but he leaves as the best soccer coach the school has ever seen. This entry was posted in IHSAA, Kokomo, Lady Kats. Bookmark the permalink.